Our popular Miter/Cut-Off saw cuts steel, brass, aluminum, wood and just about everything else in 1/10th the time it takes to cut by hand. 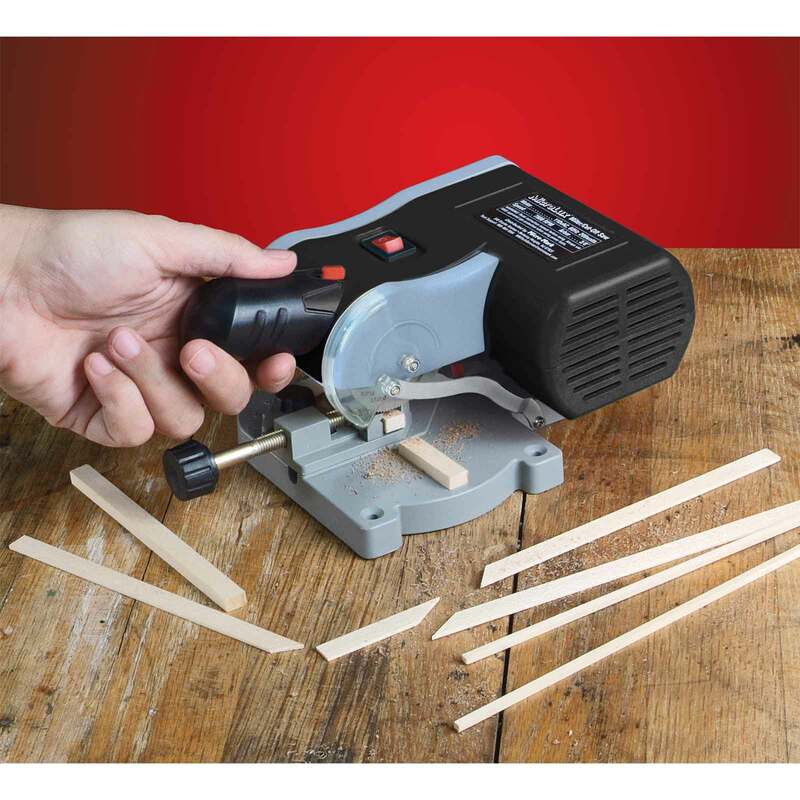 The cuts are so smooth and accurate, you may never have to file or sand cut ends again! Cuts rods, tubing, squares, miniature molding, brass and plastic shapes. Has a built-in vise that adjusts for cuts from 45 to 90 degrees. 2 inch diameter blade cuts material 3/8 inch thick x 1/2 inch wide x any length at 90 degrees and 3/8 inch wide at 45 degrees. 110/120v AC, 7800 rpm motor with 3/8 inch diameter arbor is encased in a high impact plastic housing. Base and vise are die cast aluminum. Includes one fine-cut high speed steel saw blade for wood and plastic. Overall size of machine: 5 inches wide x 8 inches deep x 6 inches high.